﻿P﻿udina ka raita (Mint Raita) is very cooling and refreshing and most commonly eaten in Indian homes especially in hot summer days. In Hindi Mint is known as Pudina. Mint leaves are dark green in color and have a fresh and aromatic pleasant aroma with a cool aftertaste. 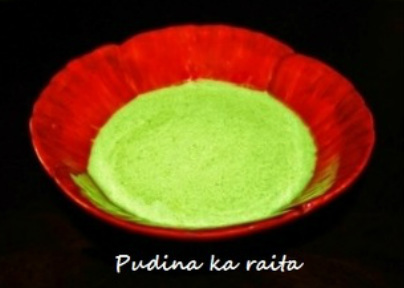 Pudiana ka raita is made by mixing the mint leaves and spices with yogurt. 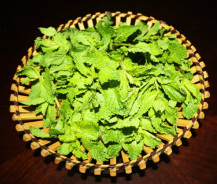 Mint leaves are either grinded or fine chopped or even dry leaves are added to yogurt. 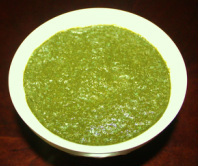 Pudina ka raita is very flavorful and could be served practically with anything. It tastes awesome with Biryanis, rice pulaos and parathas. 1. 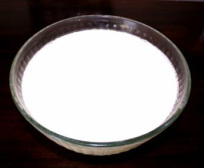 In a bowl whisk the yogurt. 3. Add mint leaves paste to yogurt and mix it well. 4. Add roasted jeera powder, salt and red chili powder to the yogurt and mix. 5. Keep raita in the refrigerator and serve it chill. kitchen counter they will dry up.